Spurs will be a little leg weary after the ten men fought back to valiantly lose 3-4 at Internazionale on Wednesday night, but will be buoyed by the way they opened up the Champions League holders in the second half, whilst a man down. The worrying aspect is that Spurs have had to come from behind a number of times this season already and while it shows a strength of character previously missing, keeping clean sheets are important to maintain their place in the top sides in the Premier League. The constantly changing central defensive pairing is not helping in building an understanding at the back and with Ledley now likely to be out for a while and Dawson still not ready to rejoin the side, it may be that Sebastien Bassong and William Gallas might have to learn to play together and do so in the first team. Everton arrive after a perfunctory 2-0 win over Liverpool in the Merseyside derby last weekend, having shown enough to see off an out of sorts Anfield outfit. So they have the confidence of a win under their belts as they arrive at the Lane. Spurs will need to show good energy in midfield where Mikael Arteta might be available after picking up a nock in last week's match, with the Spaniard being the man who makes Everton tick like a smoother Swiss clock when he is in the team. His play keeps the ball moving and his passing sets up chances, as well as his movement getting him into shooting positions ... oh .. and his free-kicks aren't bad either. Everton are suffering in midfield a bit at the moment, with Jack Rodwell and Steven Pienaar both out long term, but it should allow the likes of Seamus Coleman, who is being raved about by the media for his performances this season and Dinyar Bilyaletdinov, who is a pacy Russian with a cracking shot on him. Still there and still upsetting people, is Aussie Tim Cahill, who is a prolific scorer from midfield, mainly from set pieces, but has a side to his game which is unnecessarily brought into his play, when he is a good enough player not to need to show that side of his character. With Tottenham's midfield having put in a tough shift on Wednesday, you might be thinking they will find it hard to match the effort the Toffee's engine room puts in, but with van der Vaart and Modric being fresh from having little or no involvement in the Inter match, they will have energy to spare and the others might be ready to get their boots back on after showing they are able to match the likes of Zanetti, Sneijder and Stankovic. Everton's goal-scoring has been a problem and with Louis Saha and Victor Anichebe suffering injuries, it has been left to the returning Yakubu to lead the line and he is now doing so quite effectively again. Jermaine Beckford had been signed to share the goal-scoring load, but he has had a tough introduction into the Premier League after doing well at Leeds United last season, both in League One and in the FA Cup run, also scoring well in pre-season. However, the real thing is a different matter and unless Moyes wants to spring a surprise, he will start on the bench. Leon Osman's injury last weekend rules him out and further limits Moyes' options. At the back, Leighton Baines, Sylvain Distin, Phil Jagielka and Tony Hibbert will probably form their back four, although Phil Neville might be used at full back instead of Hibbert, is not deployed in midfield. Baines has shown he is good going forward, but his defending still needs to be worked on ad was shown in the England build-up games to the World Cup. Deadly from free-kicks though, as we know from his time at Wigan. Distin and Jagielka are almost polar opposites. The French defender is stylish and wants to play the ball, while Jagielka is a more typical English centre-half, willing to throw himself in the way of the ball and dispose of it when it needs to be. Distin has a chequered record against Spurs when playing for Portsmouth and Manchester City, with some of our players giving him a bit of a chasing. Jagielka, on the other hand, usually has a good game against us and it will be interesting to see how they cope with the new Spurs system of one up top an VDV just in the hole. Behind them, Tim Howard is a strange keeper, as he can be inspired or an have a bit of a mare, with strange decision making letting him down. For a goalkeeper, that can be costly and while he is normally sound and makes good stops from shots, he does try to come for crosses he is unlikely to take. Tottenham will need to test him out early on, to see what sort of day he is likely to have. 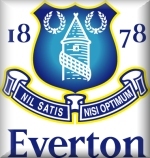 I hate games that referees spoil and I am afraid this 1-1 draw with Everton was one of them. Consequently, apart from the goals, there was little to talk about in what the teams did, with all the ire being reserved for the man in the middle (although I use the term man loosely). Mike Jones was nothing more than a boy among men and his abysmal performance left fans seething. Everton went ahead when a free-kick was given against Younes Kaboul for a challenge on the edge of the Tottenham box for what was less than had been being dished out to Peter Crouch, playing up front on his own for Spurs and by Johnny Heitinga on Rafael van der Vaart, who had his personal marker throughout the game. When Leighton Baines stepped up to take it, the ball curled over the wall and in the goal right in the top corner, leaving Gomes helpless. So a double punishment !! That was with 17 minutes gone, but three minutes later, Lennon and Hutton worked a good position on the right wing for the full-back to cross. It had looked as though it wasn't a good one, with Howard underneath it, but somehow the American glove-man managed to let the ball go straight through his hands and Peter Crouch behind him got it off his chin and knee back past him at the far post, leaving Rafael van der Vaart the simple task of blasting the ball over the goal-line from about a foot out to equalise. Spurs had started brightly, but Cahill had the first effort on goal with a shot straight at Gomes and Tottenham countered with Modric striking a low shot from outside the box that Howard got fingers to and then done the same after the goals, but unsurprisingly this time, the referee failed to spot that the decision should have been a corner. The penalty appeals from Crouch and the crowd grew more frequent with Everton placing one man in front of the England striker and one behind. The first man went low, crouching in front of Crouch and the second then came over the top - effectively bending him in half. I lost count of the times this happened, but was not disappointed when the man with the whistle failed to employ it. The ineptitude continued, with the referee's assistant failing to flag for much and when he did, he usually waited for the ref to let him know which way to give it. It was more like the referee assisting him, rather than the other way around. Things came to a bit of a head when the Dutch defender Heitinga clattered Gareth Bale and he crumpled in a heap, leaving the Spurs players standing on the ball awaiting the ref to halt the game so he could get treatment. It was only then that Jones blew up. Baines had been awarded another crack at goal from just outside the box, but this free-kick flew over the bar, while, in the last minute of the half, Alan Hutton got away on the right once more and lifted a delicate cross to the back of the six yard box, where Crouch got up for a header. He only found Howard with it, but was probably so startled that he wasn't baulked in the action of heading the ball that he forgot to put it past the keeper. Even with Wilson Palacios' Mum looking on, Harry Redknapp could not keep the Honduran on the pitch, after picking up an early yellow card and the risk of him getting another would have left Spurs exposed. So, Sandro came on and added some legs to the midfield with his strong running. Tottenham again had the better of the early part of the half, with Crouch being played in on the right side of the box, but he scuffed his shot wide after Bale had engineered the opening and the Welshman was again involved, as his flick on to Sandro's cross from the left wing ended up with Kaboul just missing getting a connection on the ball as it flashed through. Once more Crouch was presented with an opportunity, when Bale and Sandro linked on the right, but the forward failed to get enough behind his shot to trouble Howard. Cahill took a ball from Saha with more than a hint of handball before rifling it low past Gomes' right hand past, but wide. Then Assou-Ekotto made a good run and played in Pavlyuchenko, who was on as a sub for Lennon, but his shot went wide off Distin's leg for a corner and then Assou-Ekotto had a shot that went wildly high. And then the game was over. Not a classic, with Everton content to frustrate Spurs in the way of Wolverhampton Wanderers and Stoke City, but the Toffees benefitted from some more than weak officiating and Spurs carrying some heavy legs into the game following their midweek sojourn to Milan. But a point might have been a fair result, although Spurs had the bulk of the attacking play and the chances. However, they rarely looked like scoring and thus the Champions League will hopefully have taught them another lesson. I don't know where referee Mike Jones has come from, but I wish he would go back there, double-quick. His decision making was flawed, his reading of the game inept and his application of the laws of the game inequitable in almost every instance. I would dearly love referees to have to come out and explain their decisions, as how Peter Crouch getting sandwiched between two opposition players in the penalty area, when at least one, if not both got nothing on the ball, is not a penalty, then I remain a footballing know-nothing compared to this arbiter of all things in the game. When Tim Cahill goes prostrate on the floor, pushes the ball out of play with his hand and then the decision is a throw-in to Everton ... well, words fail me. I know that refs will not get every decision right, but when they get almost none right, then this means something is very wrong. Thank goodness there was nothing too controversial going on in the match.